Heat pan and add 3 sps oil. Add onions and saute for few minutes. Now add chopped carrots, beans and potato. Add salt and haldi. Mix well. Cook on medium heat for 4 to 5 minutes. Now add chili powder and cook further till done. Add cilantro and remove from heat. Heat tawa and warm the tortilla on low flame. Once the tortilla is half cooked add little beaten egg on top and spread it all over. Now turn it and cook for few seconds. Do not add egg on the other side. Remove from heat. Add this curry on top of the cooked tortilla and little grated cheese on top. Now slowly roll the tortilla and serve hot. Check to see what my fellow bloggers are cooking for BM 24. Add salt, Sooji and ajwai to maida and mix well. Add 1 sp oil and water to make a stiff dough. Rest it aside for 15 to 20 minutes. To make the filling heat pan and add 2 sps oil. Add cumin seeds and green chili. Saute and add boiled and chopped potatoes. Also add 1/2 boiled beans and carrots. Make sure all the veggi are cut into small pieces. Now add chopped onion, curry leaves and slit green chilies. Wash the okra and dry it with dry cloth or tissue. Cut each okra into 1 inch length. Heat 3sps oil in pan and add okra. Fry till they are 1/2 cooked. Transfer to another plate and add rest of the oil to pan. Now add mustard seeds, cumin, and sliced onions. Fry for few minutes and add chopped tomato. Today's recipe is Chole Bhatura. 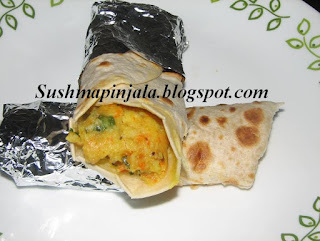 This is one of the recipe which I was planning to cook since long time. When Valli announced this theme cooking from a Restaurant Menu. I first checked if there was chole bhatura. So for today I choose Chole Bhatura under the menu "Subha ho ya shaam" from India House Vegetarian Restaurant. 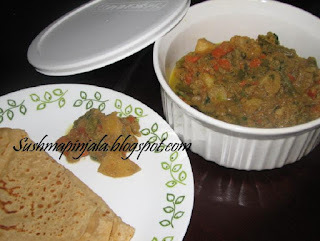 Finally am here with this yummy dish which can be had as a breakfast, lunch or as a snack. Chole Bhatura is a popular dish from Punjab India.Chole is made wiht the combination of chickpeas and spices. Bhatura is a fried bread made of Maida/ all purpose. Back with 24th Edition of blogging marathon. This week's theme iscooking from a restaurant menu. I choose India House Vegetarian Restaurant . And for the first day am cooking 1 dry curry which is Aloo methi palak from Hari Bhari Sabjiyah. 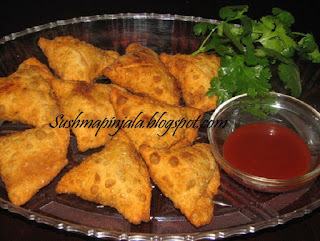 Its very simple and tastes yummy. Boil the potatoes with skin. Let them cool and peel the skin off. Cut the boiled potatoes to bite size pieces. Heat oil add mustard seeds, cumin seeds and crushed garlic. Saute for a minute and add chopped onions and green chilies. Once the onions change into golden brown, add washed and chopped methi leaves and spinach. Cover with lid and cook on medium flame for 3 to 4 minutes. Now add potato pieces and mix well.